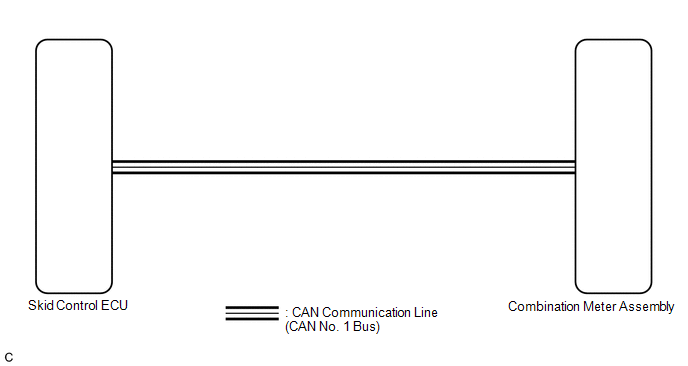 The meter CPU receives vehicle speed signals from the skid control ECU via the CAN communication system (CAN No. 1 Bus). The speed sensor detects the wheel speed and sends the appropriate signals to the skid control ECU. The skid control ECU supplies power to the vehicle speed sensor. The skid control ECU detects vehicle speed signals based on the pulses of the voltage. If the vehicle speed sensor circuit has a malfunction, the skid control ECU outputs the DTCs. Refer to troubleshoot Brake Control System (See page ). If the vehicle speed is outside the allowable range when tested, perform the following procedure (See page ). Before starting the following inspection, check tire size and tire air pressure. (a) Replace the skid control ECU with a new or a known good one (See page ). The operation of the speedometer returns to normal.